Built by the firm of Broadwood and Sons, London England, this piano represents a style of performance and sound familiar to players and composers of the 19th century. 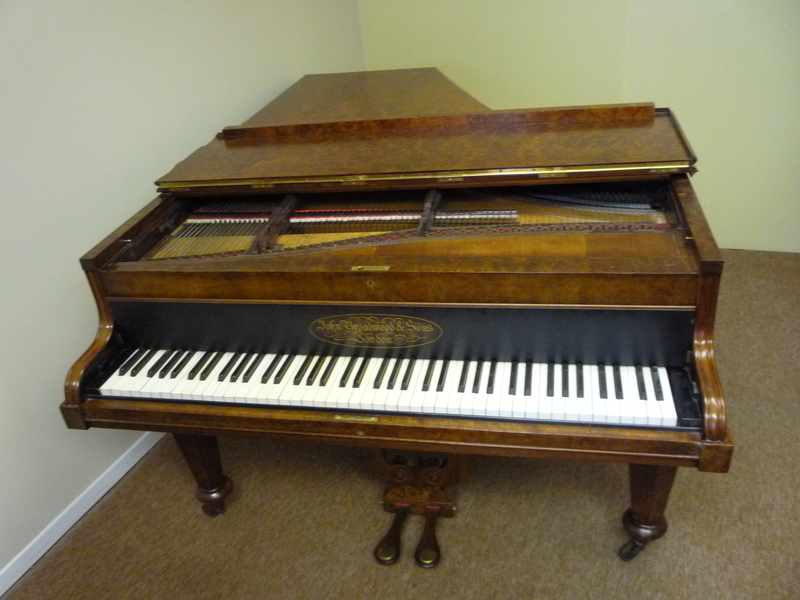 Indeed the Broadwood firm provided pianos to many composers, notable among them Beethoven and Chopin. During the 19th century the most common actions were the Viennese and the English Grand Action. The English Grand Action was considered to be stronger, more reliable and gave a wider dynamic range. Brahms and other Viennese-centric composers/performers used the Viennese-action pianos, but Chopin preferred the English style, playing Broadwood and Pleyel pianos. When in London, Chopin played extensively on Broadwoods and touring with Broadwoods for the last three years of his life. Broadwood was born 6 October 1732 and christened 15 Oct 1732 at St Helens, Cockburnspath in Berwickshire, and grew up in Oldhamstocks, East Lothian. He inherited his father James Broadwood’s (b1697 Oldhamstocks) profession, that of a wright or carpenter/joiner, and as a young man walked from Oldhamstocks to London, a distance of almost 400 miles, where he worked for the harpsichord maker Burkat Shudi. John Broadwood married his boss’s daughter. Burkat Shudi died in 1773, and John Broadwood took control of the company from his brother-in-law in 1783. Broadwood and his acquaintances William Stodart and Americus Backers are credited with devising the English Grand Action, an early piano action, and of taking piano design from the box piano to a prototype grand piano. In time his sales of pianos exceeded those of harpsichords, to the point that he ceased to manufacture harpsichords in 1793. He died in London. 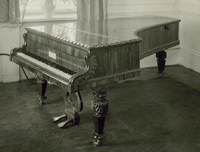 Broadwood’s other technical innovations in piano manufacture include: adding a separate bridge for the bass notes, patenting the piano pedal in 1783 and expanding the then-standard five octave range upwards by half an octave, in response to a request of Dussek, and then by half an octave downwards. Photo of the Broadwood grand played in concert in London by Chopin on June 3 1848, in the exact spot where the concert was held.